This cloth is made as a frontal. It has a plain fabric joined at it's top edge, and this is fixed at the back edge of the table. The Flannel Flower is a favourite flower of eastern Australia. 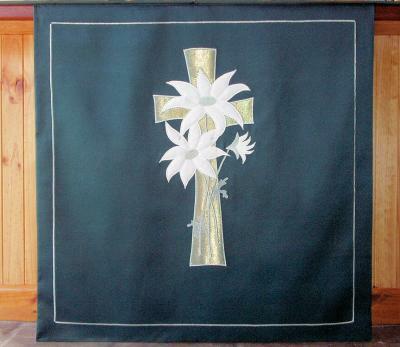 This image has been created using appliqué and free machine embroidery. 90x90 cm (35.5x35.5 ins) approx.